If you love popcorn shrimp, you’ll love this salt and vinegar popcorn cauliflower. Just as addictive but a lot healthier. For 6 summers I waitressed at a local restaurant right on the lake in town. It was basically a party (that I got paid for attending) every day because almost the entire staff were friends from high school. During double shifts other friends would come by and we’d go for a quick jet-ski ride around the lake to break up the 12 hours on our feet (sometimes falling in while wearing our required black shorts and collared purple button up sleeveless shirt uniform and end up waiting the early dinner tables while lake water dripped down our legs – classy). This summer we ended up buying lake property 4 lots down from this same restaurant (although it’s changed owners and names countless times since I worked there) and every day as I sit on the boat or paddle-board past the restaurant, I think of all those good memories. One of which was the popcorn shrimp on the appetizer menu that I practically lived on all summer long back then. Teenage metabolism was a wonderful thing, I only wish I had realized it as much at the time. Deep fried little balls of shrimp that eerily came out of the fryer looking like popcorn served with a side of cajun remoulade was my bff every day those summers. When we were actually allowed to order what we wanted to eat at the end of the shift (slow nights only) that was my dinner of choice. On the weekends though, when the place was packed and I knew there was no hope of anything but “burger family meal” at the end of the shift, I’ll admit, if you ordered popcorn shrimp and sat in any of the tables at my section, chances are I picked a piece or two off that plate in the kitchen before bringing it out to you. Spending so much time at the lake this summer and thinking about that nostalgic appetizer made me start wondering how I could recreate it without using up all my fat allowance for the week on one plate. 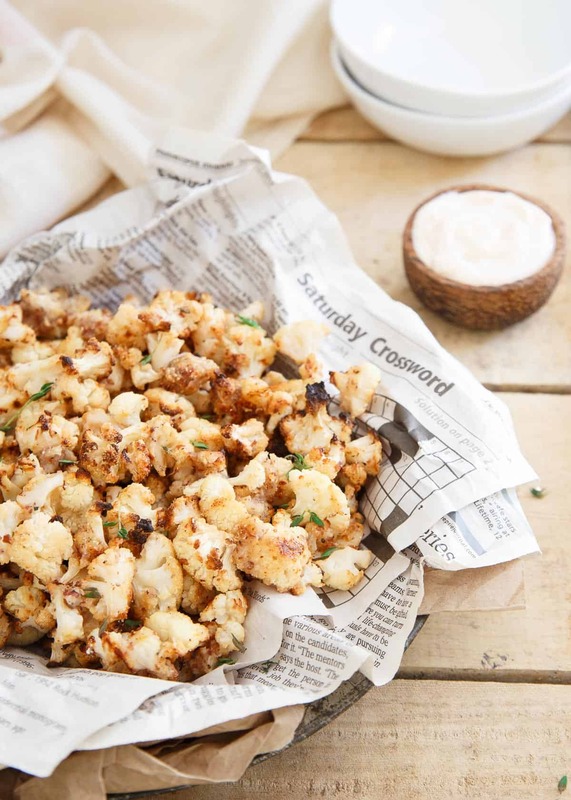 Cauliflower immediately came to mind and that’s how this amazingly addictive yet healthy appetizer of popcorn cauliflower was born. Soaking the cauliflower florets in Nakano original seasoned rice vinegar before coating them in flour (all paleo/gluten free!) and baking until crispy, lends the perfect tangy bite to each little piece reminiscent of salt and vinegar chips. It’s like a 2 for 1 all in a way healthier package that won’t make you feel the slightest bit guilty when you finish the entire plate. Not that I’d know about that or anything. *This is a sponsored post on behalf of Nakano. 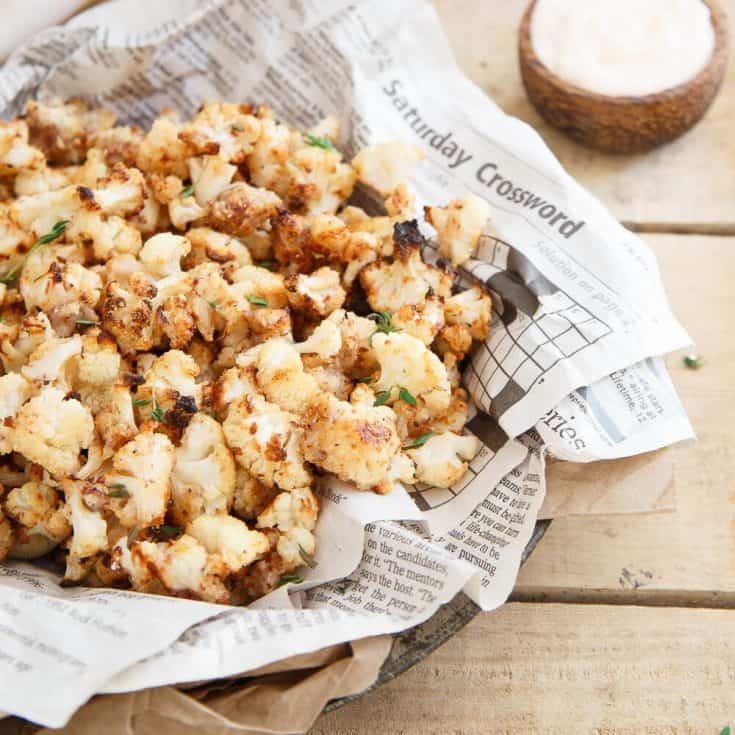 You can receive recipes like this Salt and Vinegar Popcorn Cauliflower, cooking tips, and coupons delivered to your inbox by subscribing to the Nakano e-newsletter. Sign up here. Grab a coupon and give any Nakano Rice Vinegar a try! If you love popcorn shrimp, you'll love this salt and vinegar popcorn cauliflower. Just as addictive but a lot healthier. Place cauliflower florets in a large bowl. 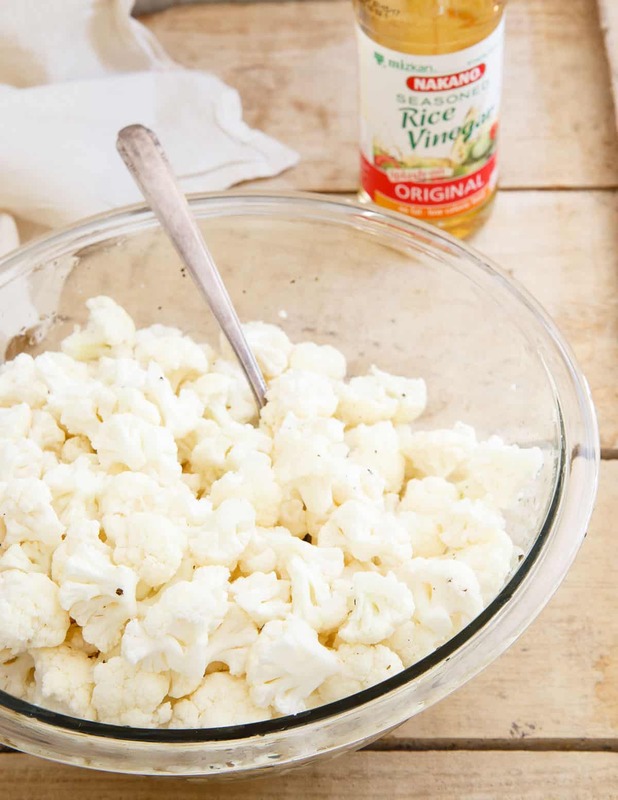 Pour the vinegar over the cauliflower and toss to combine. Set aside and let marinate for 15-20 minutes. Combine flours, salt and pepper in a large storage container or ziplock bag. 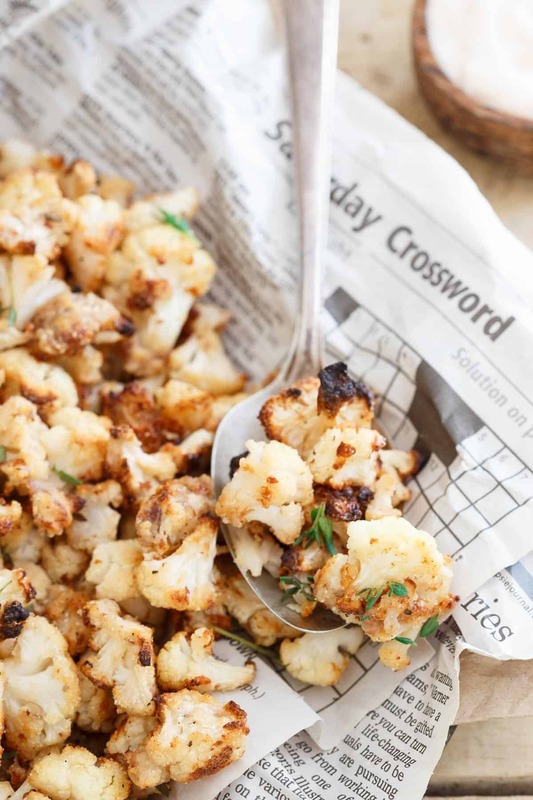 Using a slotted spoon, remove cauliflower, draining excess vinegar and place in the container with the flour mixture. Cover or close container/bag and shake until all the florets are coated with the mixture. Spread cauliflower out onto baking sheet in an even layer. Bake for 20 minutes, flip gently using a large spatula and continue baking for another 20-25 minutes until crispy and golden brown. I love the confessional feel of this post, lol! And also these are totally genius! Making them for sure, since I live for salt and vinegar and things fried! i love cauliflower! I just recently has it Buffalo Style. Gotta try it with salt and vinegar on it. My iittle guy would love this! Salt and vinegar chips are a fave of his as are cauliflower, so naturally this has to happen. I am so making this. 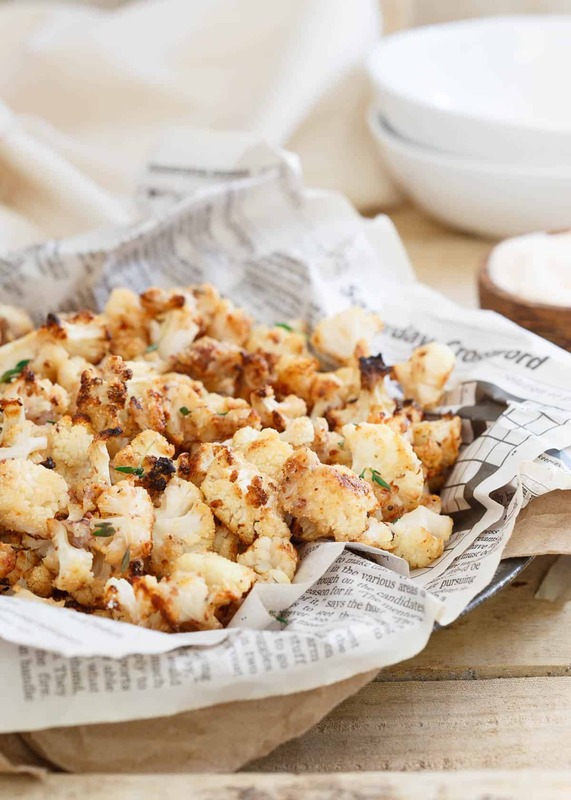 I’m always looking for new ways with cauliflower and we LOVE salt & vinegar! This looks incredible! Like I’m seriously craving this bad. Do you have to use the combo of flours or could you just do one or two of them? You could probably omit the coconut flour if you wanted to. If gf/paleo isn’t an issue for you, all-purpose would work as well. How much salt and pepper to add?